Source: Swiss Government Data. Note Switzerland is very slow in producing up to date data and is still using "the debt brake solution"
The question of a country’s national debt gets a different answer depending on who replies. The IMF counts “general government debt” as a country’s national debt. By that organization’s standards, at the end of 2017, the gross national debt of Switzerland was 42.8% as a proportion of the country’s GDP. That figure counts all of the debt of all levels of government in Switzerland. GDP is the country’s annual income. Net national debt is gross debt minus any liquid assets that a government holds, such as bonds, shares, precious metals, or foreign currencies. The IMF calculated that Switzerland’s net national debt was 23% of its GDP at the end of 2017. The OECD also calls its national debt figure “gross general government debt.” However, its calculations are actually for total public debt because they also include the debts of government-owned agencies. At the end of 2016, the OECD derived the Swiss national debt figure as 42.5% of GDP. What is the difference between national debt and national deficit? A government sets a budget every year and whether by accident or design, its income might be more than its income for that year. In that case, the government is running a budget surplus. If the government’s income is less than its expenditure, it is running a budget deficit. A deficit is how much debt a government has run up in one year. The national debt is the total amount of outstanding debts of a country’s government. So, a series of annual budget deficits will accumulate to form the national debt. The graph below shows the status of Switzerland’s government budget for every year from 1999 to 2016. A plot point above the zero line in this graph shows a government budget surplus and a point that lies below the zero line shows a government deficit for that year. The graph shows that the Swiss government had money to spare in most of the year covered by the graph. When a government has a surplus, it can pay down some of the national debt. When the government runs a deficit in a year, the national debt gets a little bigger. What is debt to GDP? Economists and financiers are not so much interested in how much a country owes, but whether a country is able to pay off its debts. A country that has a large annual income has a greater capacity of paying off a particular sum of money than a country that doesn’t earn much money each year. The national annual income is called “gross domestic product,” or GDP, and most financial statistics of a country are usually measured against that figure. The chart below shows Switzerland’s national debt as a proportion of its GDP from 1999 to 2016. 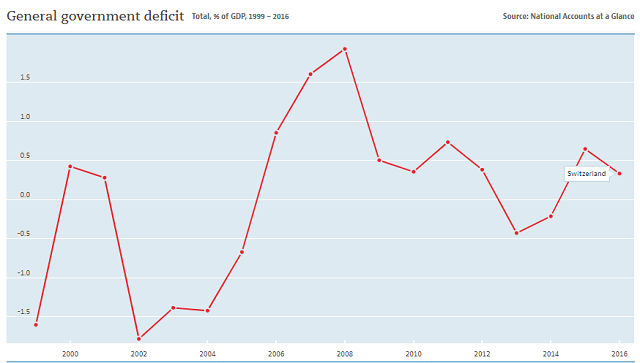 The Debt to GDP Ratio of Switzerland has been on a downward trend since 2005. 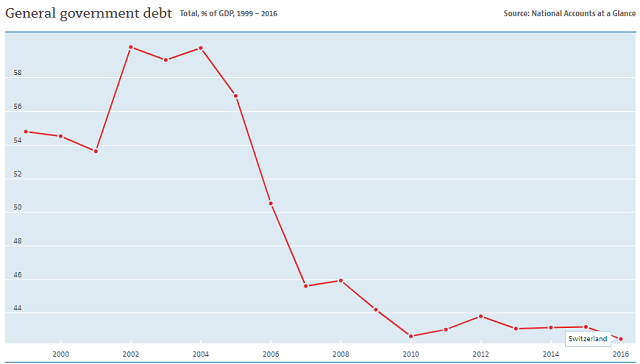 This shows that the government of Switzerland is careful not to overload the country with debt. A big reason for the fall in that ratio is that the country has become richer over successive years. 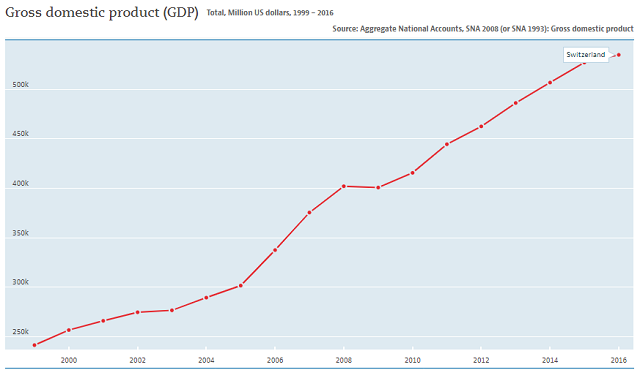 The graph below shows the rise in Switzerland’s GDP. While the Swiss government is recording budget surpluses, the country is getting progressively richer each year, so the amount of national debt that gets paid off shows up as an even bigger fall when expressed as a proportion of a rising national income. Who manages Switzerland’s national debt? The Federal government is Bern is responsible for the national debt and answerable to the national parliament. The central government’s Federal Department of Finance is directly responsible for setting the government’s budget and looking after the national debt policy. Switzerland has four official languages, so the Department of Finance has four names: Eidgenössisches Finanzdepartement (German), Département fédéral des finances (French), Dipartimento federale delle finanze (Italian), Departament federal da finanzas (Romansch). The Federal Finance Administration (FFA) is one of the divisions of the Department of Finance. This section is specifically tasked with overseeing the national debt. However, the FFA doesn’t carry out that work directly. Instead, it delegates the day-to-day management of the national debt to the Swiss National Bank, which is based in Zurich. The main unit of local government in the country is called a “canton.” Each canton is split into municipalities. Both the cantons and the municipalities have the right to raise debt. However, all of that debt activity is coordinated by the Federal Department of Finance and is implemented by the Swiss National Bank. The table below shows how each level of government has contributed to Switzerland’s national debt over the years. This data came from the Swiss National Bank. Each number represents a percentage of the country’s GDP. Given that the government isn’t taking on much new debt, the Swiss National Bank’s main activities focus on paying off existing bonds that reach their maturity. In some years, that activity may require the bank to issue new bonds to cover that expense. In 2017, the SNB raised 24.7 billion Swiss Francs of debt through a system called MMDRC and 3.9 billion Swiss Francs of debt through bonds. This raised a total of 28.6 billion Swiss Francs ($29.83 billion) on behalf of the central government. However, the government only requested 5.65 billion of this amount ($5.89 billion), the rest went to recycle maturing existing debt. How does the Swiss National Bank raise debt? The SNB uses an electronic trading platform, called SIX in order to place bonds and MMDRCs. The sales process is conducted by the “Dutch auction” process. A limited list of permitted dealers bid on allocations of securities. The process continues until the SNB has enough offers to sell all of the instruments up for auction. At that point, all of those that bid get their allocation at the price of the highest bid received from anyone in the auction. Once those bonds have been sold at an auction, the buyers are allowed to place their allocations up for sales so anyone can buy them. The Swiss electronic trading system, SIX, is used for this secondary market. What facts should you know about Switzerland's national debt? You could wrap $1 bills around the Earth 884 times with the debt amount. If you lay $1 bills on top of each other they would make a pile 24,792 km, or 15,405 miles high.